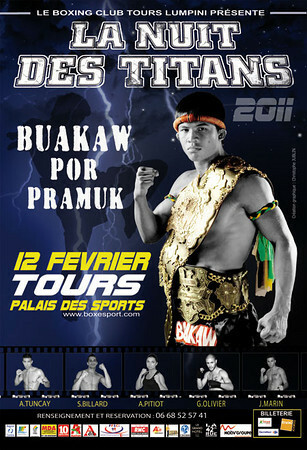 Buakaw Por Pramuk emerges victorious from La Nuit Des titans event in Tours, France. Buakaw’s opponent was the Thai Fight 2 finalist Youssef Boughanhem. It was apparent during the fight that Youssef had much difficulties with his shoulder being dislocated and in fact it proved to be a factor in the fight. Unfortunately, it made for a somewhat anti-climatic fight and one can only hope that much needed surgery can be performed soon on Boughanhem and he can return to his old form. French fans of Youssef have been aware of this long endured injury since his days of battling on Thai Channel 7 where the injury likely is from. Leading up to the fight Buakaw did look sharper and better than he has for some time and apparently returning to full Muay Thai rules competition was no great difficulty. Prior to this bout with Boughanhem, Buakaw Por Pramuk became the 2010 Shootboxing S-Cup tournament champion. Watch the video of the bout below to see for yourself the result of the fight. ~ by fatsoking on February 14, 2011.
wait, so what happened? was it from one of the throws?